Join us for a gentle, contemplative stroll where we open our senses to the forest around us and share our perspectives with others. This mostly-silent, 1/2 mile walk is best suited for ages 15 and up. 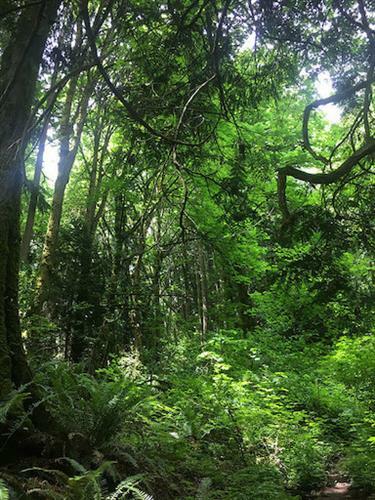 Forest bathing (called Shinrin Yoku in Japan) is a research-based activity that offers healing and wellness through immersion in forests and other natural environments. Numerous studies have shown that forest baths offer powerful health benefits, including reduced blood pressure and stress levels, a stronger immune system, better cognition, and improved energy levels. Walks are limited to 10 participants. Please RSVP for this FREE event at https://tockify.com/northcreekforest/pinboard so we can send a confirmation prior to the event. The event will happen rain or shine, so please dress appropriately for whatever the weather offers us. 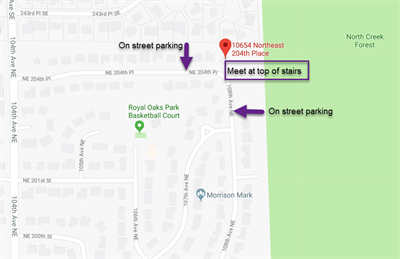 We'll meet at the top of the stairs at the corner of 204th PL and 108th Ave NE in Bothell WA. Donations to FNCF are welcome!